A team of scientists from Oregon State University has created the first global three-dimensional map of electrical conductivity in the Earth's mantle and their model suggests that that enhanced conductivity in certain areas of the mantle may signal the presence of water. What is most notable, the scientists say, is those areas of high conductivity coincide with subduction zones - where tectonic plates are being subducted beneath the Earth's crust. Subducting plates are comparatively colder than surrounding mantle materials and thus should be less conductive. The answer, the researchers suggest, may be that conductivity in those areas is enhanced by water drawn downward during the subduction process. Results of their study are being published this week in Nature. "Many earth scientists have thought that tectonic plates are not likely to carry much if any water deep into the Earth's mantle when they are being subducted," said Adam Schultz, a professor in the College of Oceanic and Atmospheric Sciences at Oregon State and a co-author on the Nature study. "Most evidence suggests that subducting rocks initially hold water within their minerals, but that water is released as the rocks heat up." "There may be other explanations," he added, "but the model clearly shows a close association between subduction zones and high conductivity and the simplest explanation is water." The study is important because it provides new insights into the fundamental ways in which the planet works. Despite all of the advances in technology, scientists are still unsure how much water lies beneath the ocean floor - and how much of it makes its way into the mantle. The implications are myriad. Water interacts with minerals differently at different depths, and small amounts of water can change the physical properties of rocks, alter the viscosity of materials in the mantle, assist in the formation of rising plumes of melted rock and ultimately affect what comes out on the surface. "In fact, we don't really know how much water there is on Earth," said Gary Egbert, also a professor of oceanography at OSU and co-author on the study. "There is some evidence that there is many times more water below the ocean floor than there is in all the oceans of the world combined. Our results may shed some light on this question." Egbert cautioned that there are other explanations for higher conductivity in the mantle, including elevated iron content or carbon. There also may be different explanations for how the water - if indeed the conductivity is reflecting water - got there in the first place, the scientists point out. "If it isn't being subducted down with the plates," Schultz said, "how did it get there? Is it primordial, down there for four billion years? Or did it indeed come down as the plates slowly subduct, suggesting that the planet may have been much wetter a long time ago? These are fascinating questions, for which we do not yet have answers." The scientists conducted their study using electromagnetic induction sounding of the Earth's mantle. This electromagnetic imaging method is very sensitive to interconnecting pockets of fluid that may be found within rocks and minerals that enhance conductivity. 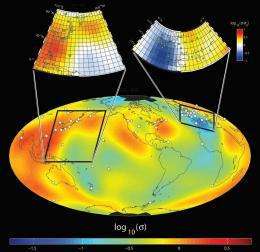 Using magnetic observations from more than 100 observatories dating back to the 1980s, they were able to create a global three-dimensional map of mantle conductivity. Anna Kelbert, a post-doctoral research associate at OSU and lead author on the paper, said the imaging doesn't show the water itself, but the level of conductivity and interpreting levels of hydrogen, iron or carbon require additional constraints from mineral physics. She described the study of electrical conductivity as both computationally intensive and requiring years of careful measurements in the international observatories. "The deeper you want to look into the mantle," Kelbert said, "the longer periods you have to use. This study has required magnetic field recordings collected over decades." The scientists say the next step is to replicate the experiment with newly available data from both ground observatories and satellites, and then conduct more research to better understand the water cycle and how the interaction with deep-Earth minerals works. Their work is supported by the National Science Foundation and NASA to take the next steps in this research program. Ultimately, they hope to produce a model quantifying how much water may be in the mantle, locked up within the mineral-bearing rocks. Why is the Earth's mantle conductive? The record of Earth's degassing is still available today in the amounts of primordial and radiogenic He, Ne, Ar, Kr and Xe in air and in the mantle.